Arils are subdivided into two major subsections: Oncocyclus and Regelia. The oncocyclus irises have beautiful and exotic markings and often have a broad, globular form and large, dark, velvety signal patches on the falls. They have only one flower per stalk, but the bloom is usually large and spectacular. 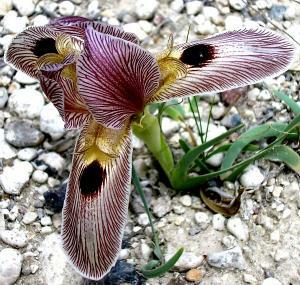 Shown here is the onco species Iris sprengeri. The regelia irises are typically more tailored in form, with narrow petals and long, slender stems. Some are veined, others have smooth, solid coloring. Regelias usually have two flowers per stalk. Plant breeders have produced a number of hybrids from the aril species. These aril hybrids show the full range of flower characteristics of the species, often in interesting combinations. A hybrid that is mostly oncocyclus in ancestry is called an oncogelia; one that is half regelia or more is called a regeliocyclus. Some people incorrectly use the term "aril" to include the arilbreds. "Aril" properly refers only to the aril species described above and to hybrids whose ancestry is purely aril. 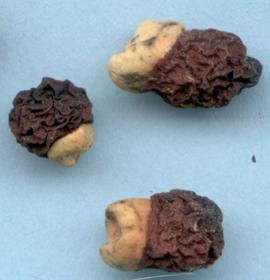 The photo at right shows the creamy white collar on the seeds for which arils are named. A complete list of aril species is included in the ASI Checklist. Iris sprengeri photo by Abdullah lafcý. Seeds of I. hoogiana photo by Robert Pries.